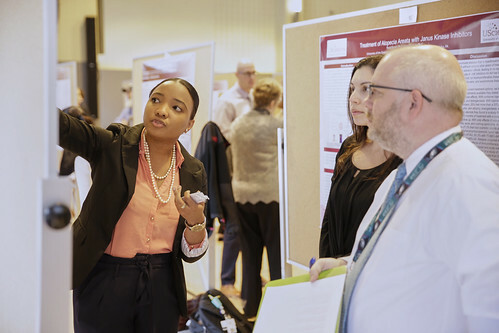 More than 240 student researchers and their faculty advisors presented novel research being conducted throughout the University’s four colleges during the 16th Annual Research Day on Thursday, April 5, 2018. Posters filled two gymnasiums inside the Athletic/Recreation Center that promoted communication and collaboration between investigators at the University who examined each other’s findings. Because of the University's size, most undergraduate students can conduct research with faculty early in their academic careers. Jaspal Brar BI’18 presented research he has been doing in the lab of Bela Peethambaran PhD, focused on the use of Myrothamnus flabellifolius, a South African medicinal plant which contains extracts that are selectively toxic to breast cancer cells, while leaving healthy cells unaffected. Brar’s research showed that the compound made from the plant is effective to kill cancer cells but left the non-cancerous cells unharmed. A group of students in the master of occupational therapy program conducted a literature review on the research done using virtual reality to combat the debilitating effects of PTSD in patients. Lindsey Hunt MOT’19, Sara Stofanak MOT’19, and Jennifer White MOT’19 said the PTSD studies have shown promising results, so they are proposing for occupational therapists to study the use of similar technology to help patients adjust to everyday tasks. Mahima Singh PhD’19 (pharmaceutics) presented research from her lab, led by Kamal Jonnalagadda PhD, of a novel type of scaffold for dermal regeneration made using a 3D-printing technology. The scaffold could be used under the skin to release medications to help in wound care and would be degradable, preventing the need for a second surgery to remove the device. In an examination of the prevalence of C. difficile, of C. Diff, infection at a local hospital, Ashley Russell MPH’18 found that by adapting existing policies, hospitals could limit the frequency or length of infection. The Krantz Lecture was established in 1984 in honor and memory of John Christian Krantz, Jr., PhD, who was the chairman of the Department of Pharmacology at the University of Maryland School of Medicine from 1932 to 1965. Dr. Krantz served 13 years as a member of the board of trustees. Through the annual lecture, the University continues to honor Dr. Krantz’s distinguished career, humanitarianism and his positive influence on generations of physicians and medical scientists. For the second year, Research Day was preceded by the Undergraduate Research Festival hosted by the Center for Undergraduate Research. From March 13 through 15, the festival hosted “Images of Research and Scholarship,” a visual competition featuring nine stunning images produced by undergraduate researchers on display in the atrium of the McNeil Science and Technology Center. In addition to faculty judges for the images, an online poll was held to determine a “popular choice award” from the CUR Facebook page.